New Crow Chayce Jones will become the fourth Tasmanian to occupy the No. 20 locker at West Lakes, following in the footsteps of recent custodian Hugh Greenwood. Greenwood, born-and-raised in Hobart, wore No. 20 in 2017 before taking on No. 1 last season, making him the third player from the Apple Isle to wear the number. AFL Tasmania Hall of Fame member John Klug was the first Tasmanian owner, while Sam Siggins from Lauderdale also held the number while he was at the Club. Tyson Stenglein played the most games in the No. 20 for the Crows, registering 106 appearances while Ivan Maric played 77 before joining Richmond. Jones, who was Adelaide’s first selection in the 2018 draft at pick No. 9, was among eight new Crows to receive their guernsey numbers for next season. 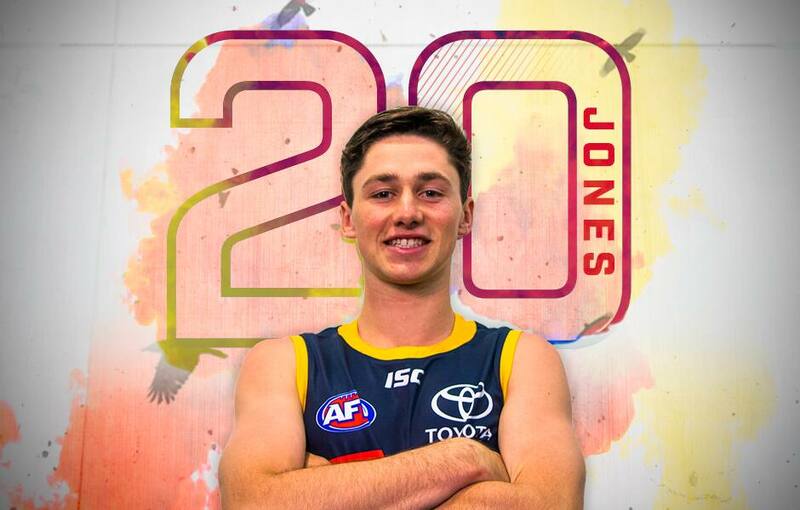 “Makes me feel proud… Tassie’s a football state and to keep the connection with the Crows and Tassie players is great,” Jones told AFC Media. Fellow first-round draftee Ned McHenry will take on the No. 25 which was vacated by Kyle Cheney. Will Hamill takes over No. 35, most famously worn by premiership hero Rod Jameson, while Lachlan Sholl will take on No. 38. Adelaide’s two selections in the rookie draft Jordon Butts and Kieran Strachan will wear No. 41 and No. 45 respectively. “I was a Geelong supporter growing up and Cameron Ling wore 45 and he’s got the red hair and freckles too, so I thought why not,” Strachan said. Shane McAdam, who was recruited to Adelaide during the trade period, will wear No. 23, made famous by Club legend Andrew McLeod. Also picked up during the trade period, Tyson Stengle will don No. 17, left vacant after Curtly Hampton announced his retirement in 2018.